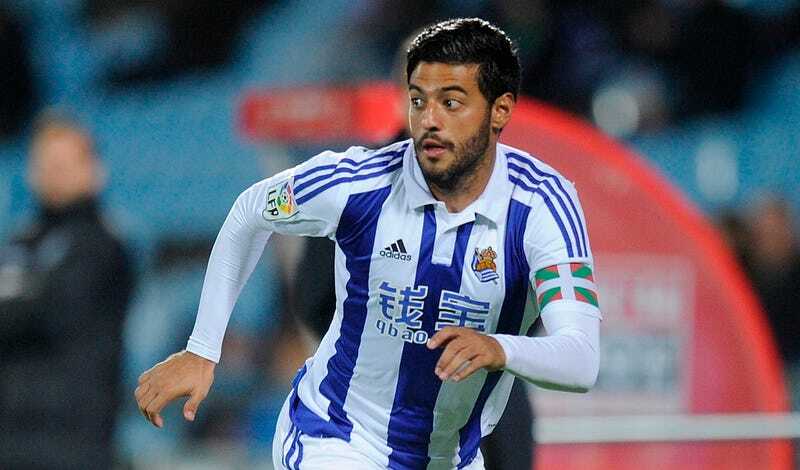 Real Sociedad forward and sometimes Mexico international Carlos Vela found himself torn between his love and his livelihood a couple weeks back, and his solution to the conundrum has now literally cost him a pretty penny. On the 6th of March, La Real had a home game against Levante, a 1-1 draw in which Vela played the entire match. Later that night, there was a Chris Brown concert in Madrid that he really wanted to go to. Only thing was, he had practice back home in San Sebástian the next morning. Instead of doing the safe thing and flying back home with his teammates after the game and maybe bumping Royalty on the flight home, Vela pressed his luck and showed up to the concert. Unfortunately, after a late night of listening to “Run It!” live, he decided he couldn’t run it in practice on Monday and skipped out. While the other Spanish members of #TeamBreezy were undoubtedly impressed by Vela’s dedication, Real Sociedad were not so amused. La Real’s manager held Vela out of practice for a couple days following the revelations, but eventually brought him back into the fold. While Vela started the next match this past weekend on the bench, he was eventually subbed on. The club has finally settled on a punishment, though, today hitting the Mexican with an €100,ooo fine. Whether it was worth that much to sleep in the morning after dancing the night away to “Don’t Wake Me Up” is a question only Vela can answer. [Update March 18, 8:50 a.m.]: This post originally described the fine Vela received as €10,000 when it was in fact €100,000. It has been corrected now.